Turin-based design studio Yet Matilde is walking a fine line between producing textiles and furniture. Their latest creation, Continuous Function, is a furniture line made from hardening a continuous piece of natural fabric into wonderful and unusual pieces of furniture. 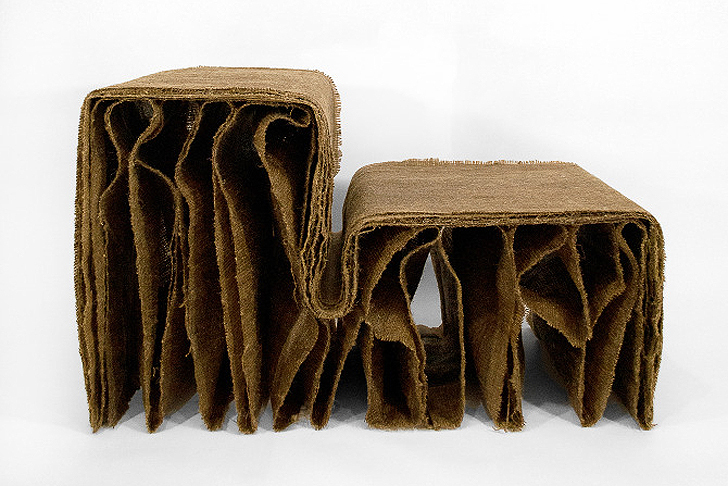 Bookshelves, seats, tables and desks — they are all included in these quirky collection of furniture that takes a 3D shape from two-dimensional pieces of natural fabric. Turin-based design studio Yet Matilde is walking a fine line between producing textiles and furniture. Their latest creation, Continuous Function, is a furniture line made from hardening a continuous piece of natural fabric into wonderful and unusual pieces of furniture. Bookshelves, seats, tables and desks -- they are all included in these quirky collection of furniture that takes a 3D shape from two-dimensional pieces of natural fabric.